The Streatham & Brixton Chess Blog: Is this the most drawish variation in the world? Search Chessbase Online Database for occurrences of this position with both players graded 2400 and above. 135 hits. One win for each colour. 133 draws. I can see that this is quite a symmetrical position so it could be drawish. White looks like he's threatening Nb5 so maybe 1...Bxd3 2 Qxd3 a6 is in order; but why so many draws? Perhaps someone could educate me as to the drawishness of this position. 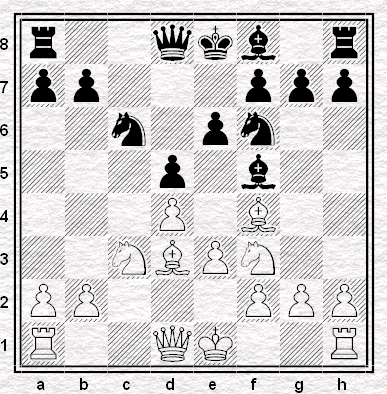 Symmetrical position, lack of pawn breaks, open file on which major pieces can be exchanged. All these things make it hard to work up play. It feeds on itself a bit, since one reason there's so many draws in this line is that GMs who want a quick draw aim for it - in other words even if the draw isn't pre-arranged, it's often a tacit draw offer anyway. In particular, if White were trying to win then even if he or she played the Exchange Slav, 8.Bd3 would be a strange move to make (8.Bb5 is more ambitious). Most of the games feature 8...Bxd3 9.Bxd3 Bd6, too, which keeps things symmetrical and brings more exchanges. If not a draw offer too in itself, it is at least saying that if White wants a real game it's up to them to make one. You can try and win this position playing 9...Be7 (and sundry other moves have been tried maybe once) but it's a real grind. Yawn... A problem with playing the Slav as Black is that White may opt for the Exchange variation... and then there isn't much Black can do to unbalance the position. Perhaps he can play Ne4 early on or maybe a6 before developing the QB in the hope that White may then commit his KB and not be able to exchange pieces so easily (but I don't think these Black ideas amount to that much)... There is a line where White can try for something by gaining space on the K-side. Perhaps it's with 8 Be2 (rather the 8 Bd3) followed by Nd2 and g4. I don't like the ...a6 idea at all (I've nearly always lost correspondence games where I've played ...a6 in the Exchange Slav) and while the ...Ne4 idea is interesting I'm not sure I believe it - and you maybe find yourself in one of those Grunfelds where everything tends to get exchnage off in the middle. Still, worth a try. Probably the best idea of course is to play the lines with ....Bf5 and study them really carefully. It'll be rare to come across an opponent who'll be well-versed in the line and lower-rated and playing for the draw when you want the win. How many of those 133 draws went beyond 15 moves? If you think I'm counting that, Andrew, you are sorely mistaken sir.